A medical-grade manicure & pedicure is a sound choice for patients who have their diabetes under control. Discoloration due to toenail fungus. All Manicures and Pedicures Start with Tea Tree & Vitamin E Oil Soak. Tea Tree Oil helps to prevent and treat any nail fungus, while Vitamin E Oil deeply penetrates to renew, repair and condition the skin. Deep exfoliating hand & Foot treatment, aromatic soak, nail and cuticle care, rejuvenating mask with a hot towel wrap, reflexology massage, soothing Anti-Aging hand treatment includes French Manicure & Pedicure. This manicure features an aromatic soak, nail and light cuticle care, hand massage with your choice of color or nail buff. Includes an aromatic soak hand, nail and cuticle care, rejuvenating sugar scrub, a reflexology massage, with your choice of color or buff. Turn back the hands of time with this deep exfoliating hand treatment, aromatic soak, nail and cuticle care, rejuvenating mask with a hot towel wrap, reflexology massage, soothing Anti-Aging hand treatment with you choice of color of buff. Minx are applied with non damaging heat procedure which adheres minx to natural and artificial nails. Minx are available in many colors and designs. Minx will last up to 2-3 weeks on fingernails and 4-6 on toenails. 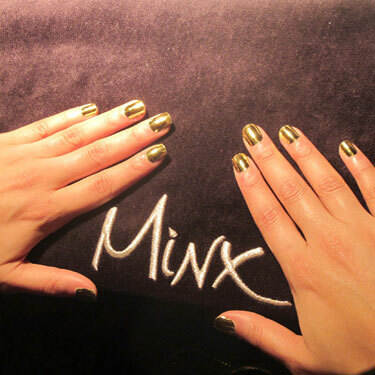 Minx features light cuticle care and Minx applied ONLY. (300 different designs are available for order Minx.com, price included). We do have designs on hand. Classic Manicure & Pedicure with Minx applied. This pedicure features a softening foot soak, cuticle care, a soothing foot massage with choice of color. Includes an aromatic foot soak, cuticle & callus removal, sugar scrub, foot massage, and choice of color. a rejuvenating treatment which includes an exfoliating sugar scrub, mask with a relaxing Hot Towel Wrap, cuticle & callus removal, foot and leg massage. Color choice includes french. Prevent diabetic foot complications with attention to proper foot care. A medical-grade pedicure can be an important part of preventative foot care for diabetics. Our licensed professionals understand the anatomy of the foot, diseases of the skin and nails, and the complications associated with diabetes. Your technician will check your feet carefully for open wounds, pressure spots, infections or other signs that may indicate a problem. A Board Certified podiatrist is always nearby if your technician finds anything that requires medical attention. Your pedicure experience starts with a relaxing soak in a warm whirlpool bath to soften and hydrate your skin. We add Tea Tree oil to the bath for its anti-fungal properties. It also smells great! Then your technician trims your nails and carefully pushes back your cuticles so as not to break the delicate skin. We exfoliate your legs and feet, which removes dead or dry skin, and follow up with a hydrating mask to help retain moisture. Before we finish your pedicure with a buff or nail polish, we’ll massage your legs and feet to further lock in moisture and nutrients. *Laser Treatments Available for Toe Fungus – Free Consultation.